Part 1 - mostly Puerto Rico. Part 2 Autumn in Victoria - Bells/Southside/Lorne (double exposure)/Greenough (?) water footage. Yellow with deck patch,clear bottom with 2" black pinlines/square decals 8 ft? *Three clear/three stringer boards made at Michael Barrland Surfboards, France. Nat Young #3 : 4th. Midget Farrelly : Midget Farrelly Surfboards Red with :Blue wing, Yellow deck Pintail 7ft 4"? - 2nd. Skip Frye: Gordon and Smith Surfboards Yellow-green nose patch Squaretail.+7ft? Russell Hughes:Yellow Squaretail by Bob McTavish 7 ft 6" -3rd. Keith Paull: The Foil by Bing Surfboards, Red, white deck 7ft 6"? David Nuuihwa: Red,White/Blue deck Pintail with early Ying-Yang logo -down rails? Reno Abellira: Brewer Minigun Blue, red bottom sub 7 ft? -down rails - 6th? Fred Hemmings: Greg Noll Surfboards Red, Yellow deck 9ft 6"? - 1st. Mike Dolye : Hansen Surfboards Blue white deck pintail +8ft? -5th? Ted Spencer #4 Shane Surfboards clear egg sub 7ft ? Nat Young #4 Green Weber gun, + 8 ft 6" with low soft rails- broken - 1st. Wayne Lynch #8 John Arnold Surfboards Green deck, Yellow bottom - 1st Junior. David Treloar: Nipper Williams Surfboards Blue, yellow bottom +7 ft? 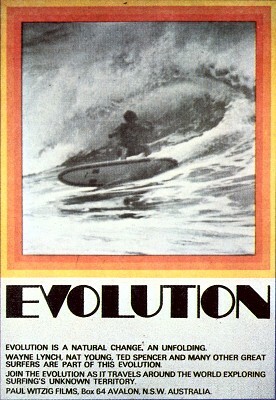 Richard Harvey: Ron Wade Surfboards. 1. No commentary format similar to George Greenough's The Innermost Limits of Pure Fun,1969and repeated in next Paul Witzig's next film, Sea of Joy. Later used by Alby Falzon in The Morning of the Earth, 1972. 2. First footage of North Africa. 4. Part 8 uses Ravell's Bolero as soundtrack, 20 years before Torvill and Dean (Olympic Ice skaters) and Blake Ewards in 10. 5. The surfing of Wayne Lynch is outstanding throughout.